Here are 5 creative t chart ideas in PowerPoint. Get inspired to create more variations of these templates on your own for your business presentations. What is a t chart template used for? ‘T chart’ helps you list two facets of a subject next to each other. They may be Pros and Cons of an idea, Myths and Realities, Facts and Opinions, features and benefits, For and Against, Advantages and Disadvantages etc. When you see two sides of an issue placed adjacent to each other, you can make better business decision. That is why, t chart templates are an essential part of most business presentations. Why bother with creative options for t- chart? You can easily list the two facets by drawing a simple t- shape on a slide. Right? Why should you even bother coming up with creative options? The reason is – most t charts are quite intimidating, because they look like two columns of bullet points. It is not easy for your audience to get the context quickly. So, they disengage. A creative t chart quickly provides the context for comparison. It grabs and holds the audience attention. So, your message gets across effectively. 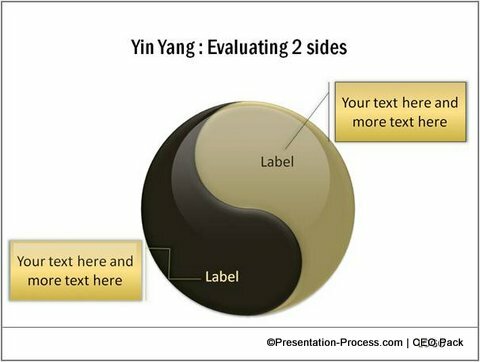 Yin Yang represents two interconnected yet independent forces that co-exist. In your business presentations, you can use the diagram as a metaphor for the roles assigned to Frontline and Support teams. You can explain your strategies for ‘walk-in’ and ‘on field’ customers. Or explain ways to improve ‘First time sales’ and ‘Repeat sales’. The diagram helps you to set the context for your idea at a far deeper level than just a simple t- shaped table. To press a button, means to ‘take action’. 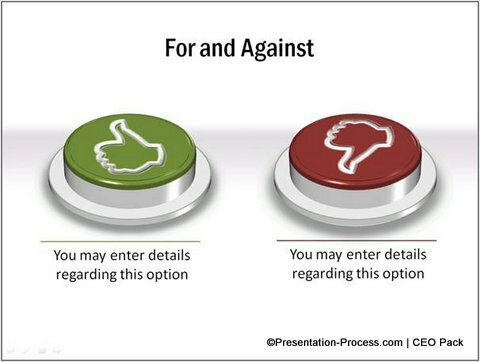 When you use Green and Red buttons to explain factors ‘For’ and ‘Against’ a decision, you have a wonderful tool to summarize your points in marketing or sales presentations. You can use the template in your business plan presentation, to talk about factors to ‘choose’ or ‘drop’ a potential customer segment. You can even use the template to poll your audience on a topic. This helps you take your simple t-chart to the next level. 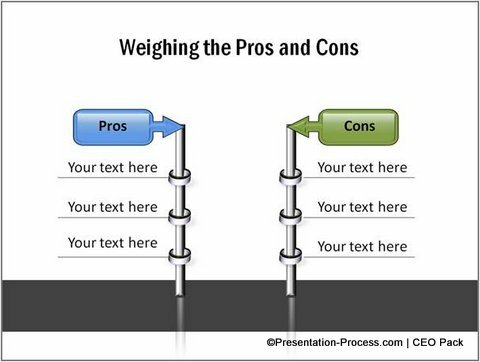 A product presentation is incomplete without a slide on Caveats and Benefits. Having clear icons to indicate the nature of your argument helps to make your points clearly. A good photo has the power to arouse visual interest on a topic. For example, the above template can be used to convey myths and realities, facts and opinion etc. Introducing the elements one after another with subtle custom animation keeps the interest of your audience alive. 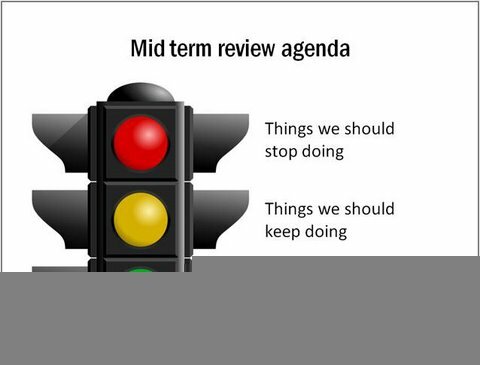 If not anything else, you may use some simple visual metaphor like sign post, instead of a boring t chart template. Take a look at the diagram template above for example. This helps your audience to organize your information easily. 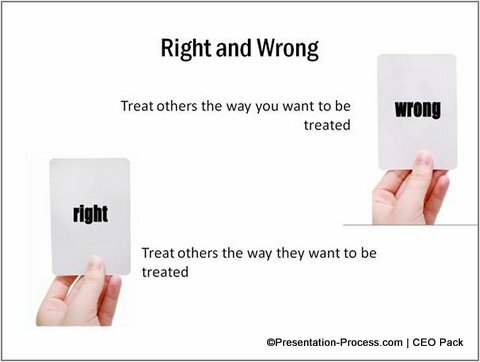 The diagram templates you saw in this article are part of our ‘750+ PowerPoint Charts and Diagram templates pack for CEOs’. The pack has tons of creative ideas to make your business presentations more insightful and effective. The interesting part is – all the 750 diagrams in the pack are fully editable. So, you can change colors, size, animation and position of the elements to suit your needs. In fact, you can pick elements from different slides and create new diagram templates of your own. If you are a business presenter, the diagram templates pack is an essential investment to increase the effectiveness of your message. Why leave your critical presentations to chance, when you have such a useful resource available off the shelf?